Japanese Nationalism: Decoy for American Imperialism? As the government of Japanese Prime Minister Shinzo Abe seeks to amend the country’s US-drafted constitution, granting the Tokyo’s military the power to wage war, some fear the return of old imperialistic tendencies. Japan is ready to change its post-war pacifist constitution; it is rapidly arming itself to the teeth, building battleships and purchasing fighter jets. Recruitment posters are everywhere. Meanwhile, Japan is standing – obediently and loyally – by its occupier and closest ally, the United States. In light of the situation, one has to wonder what is really ‘nationalist’ about Abe? His loyalties appear to lie towards the West, particularly the United States. Definitely not towards his own country and the Asian continent. All that the US desires, Japan supports. Washington is dreaming about a ‘Pacific Century’, in which it would play a decisive role; it is relentlessly promoting its ‘Pivot to Asia’ doctrine, which envisions Japan firmly by its side, militarily and demagogically; it is pushing for 12-nations Trans-Pacific Partnership (TPP), and Japan claps. In Wakkanai — the northernmost city in Japan from which the Russian island of Sakhalin can be seen — military radars and surveillance systems are humming and coastguard ships are standing by in the historic harbor, ready for action. Almost all signs in the city are written in Japanese and Russian, including those warning that male visitors to the hot spring will be prosecuted if they enter the female section. From the window of my hotel I can see Sakhalin, if weather allows. During the summer, two mighty sea vessels are shuttling Japanese tourists between Wakkanai and the Russian town of Korsakov, situated on Sakhalin Island. Russian fishing boats regularly visit Hokkaido Island, where there are cultural exchanges and even some trade. In the Pechika restaurant, delicious Russian food is served, beer flows and Russian songs are sung (a popular tune is ‘A million red roses’). Across from the parking lot, the Fukakō-ichiba complex proudly displays old black-and-white photos from the days when Sakhalin, and in fact all of the Kuril Islands, belonged to Japan. The islands constitute an issue that has never been resolved. Japanese propaganda is constantly repeating the claim that the Soviet Union grabbed the Kurils at the end of WWII. For decades Japan has been demanding their return. We have an extreme-right-wing prime minister here in Japan. He is very close to the United States, a country that is antagonizing, and in fact most likely wants to destroy, both Russia and China. If the Kuril Islands and Sakhalin go back to Japan, they would be immediately converted into another Okinawa; full of US Air Force and naval bases, very near the Russian mainland. Some 3,000 km away, the former ancient kingdom of Okinawa is living a continuous nightmare of occupation and consequent militarization. From here, thousands of US and Japanese aircraft regularly provoke China and North Korea. At the same time, local residents are outraged at the occupation as massive demonstrations shake the islands; people are demanding an end to the US military presence and want the US bases dismantled. But Abe’s government wants more US hardware, more runways and more war games. I worked in Okinawa on two occasions. The last time was in 2013/14 when I was involved with a documentary film about the American bases, Battle of Okinawa, for South American network TeleSUR. 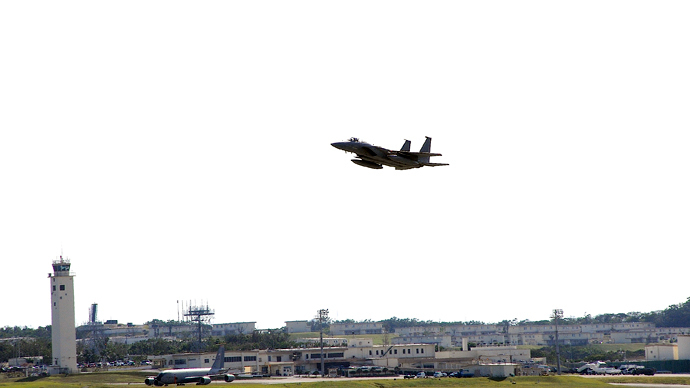 Okinawa hosts about 75 percent of the American troops and American facilities in Japan. It’s out of sight and out of mind of most of the Japanese people on the mainland. Okinawa is a thousand miles away from Tokyo, from the capital. If you talk to Okinawans they’re angry and disappointed that for over 60 years now they’ve been asked to essentially shoulder the American-Japanese military alliance. The military alliance with America is also accompanied by what critics would say a subservient attitude towards Washington in general. 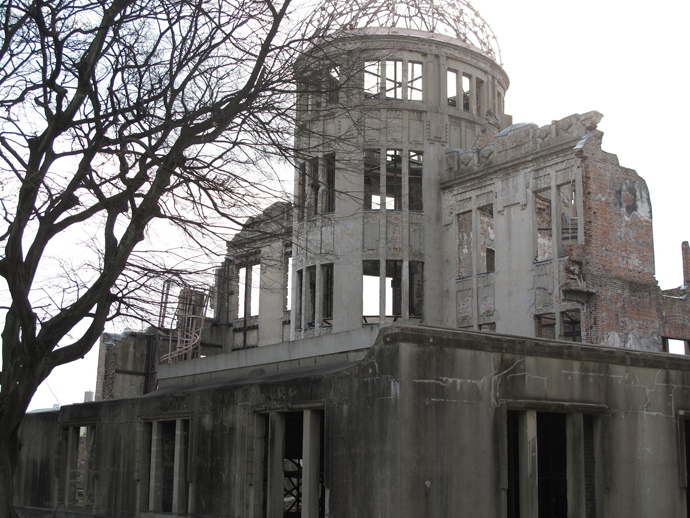 Japan rarely balks against what Washington wishes on foreign policy. The bases are now expanding even to pristine parts of Okinawa, like Haneko Bay. “We think that US imperialism uses Japanese colonialism against us. The Japanese government made a security treaty with the United States, and then the United States used Japan to force us, Okinawans, to accept the US military bases,” he explained. There is no doubt that the bases are there to antagonize, to provoke China and North Korea, as well as Russia. Many believe that the WWIII could easily begin from Okinawa. All changed when the Abe government nationalized the Senkaku/Diaoyu [Islands]. The status quo changed because now Japan declares that there is actually no dispute over these so-called disputed islands. Therefore the Tokyo government has angered China. China is indignant with this change of the status quo. For many years, Japan was able to boast of the smallest disparities between rich and poor anywhere in the world, as well as developing an incredibly compassionate social model. No matter how right wing some its rulers may have been, in many ways, Japan could easily pass as a socialist country. But there is one essential problem: It is socialist only for its own people. For decades, Japanese corporations have been behaving like colonialist thugs all over East Asia. For instance, I was told repeatedly that Japanese car manufacturers had destroyed many cities, corrupting local governments, forcing them not to build comprehensive public transportation systems. Now numerous megalopolises like Jakarta or Surabaya, which are choking on car and scooter fumes, lack a single subway line or light rail system. The reason for this is largely explained by Japan’s efforts at indoctrinating Asian peoples with a pro-Western worldview. For decades, Japanese universities had been offering ‘scholarships’ to students from poor Southeast Asian nations. They would indoctrinate these students with pro-Western dogmas, breaking the revolutionary spirit, while converting young people to behave as servants of the Empire; essentially doing to other Asians what was done to the Japanese. After being defeated in WWII, Japan eventually became loyal to its Western masters. Many Asian leaders, including former Malaysian Prime Minister Mahathir Mohamad, demanded that “Japan return to Asia.” It never did. It became rich during the Korean War, manufacturing goods and equipment for the Western military might. It continued doing the same during the Vietnam War. It is on the same course now. They are rewriting text books; they skip through WWII, dedicating to it only eight pages… Nationalism is rising. Naoki Hyakuta, a comedy writer, published a novel about Kamikaze fighters, entitled Forever Zero… The novel sold 5 million copies! You know that nothing sells 5 million copies in Japan! There is so much self-censorship in Japanese media, now. And the government is issuing ‘guidelines’, so called ‘Orange Book’, for instance: how to treat anything that is ‘contagious’… or anything related to history. There are instructions to writers and translators. For instance: ‘never use words like Nanking Massacre, except when you quote foreign experts’. 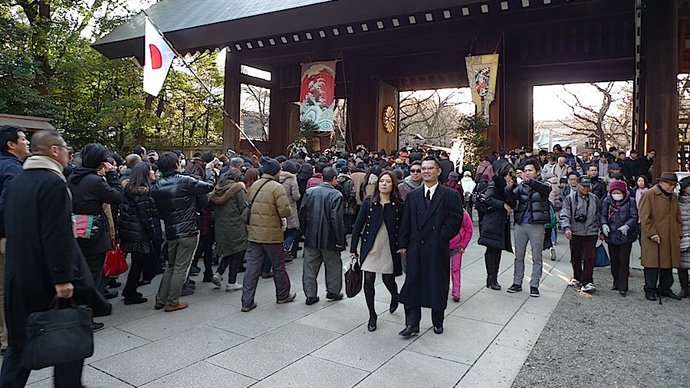 Or ‘Yasukuni Shrine – never use word “controversial” in connection to it.’ We cannot write about ‘sexual slaves’ from WWII. I am also told that the Japanese public is given a one-sided interpretation of current affairs. When it comes to topics like Russia, Syria and China, Japanese people are made to consume Western propaganda exclusively. “And they actually believe what the NHK says,” says David. In Japan, people will not understand that the West is behind those ‘color revolutions’ and recent events in Hong Kong. Here, there is total consensus that HK was a movement for freedom and democracy. It is because there are hardly any alternative sources of information available. Even in the places like Abu Dhabi and Beirut, television channels like RT are available in every major hotel. Not in Japan. In all big international chains, it is mainly a diet of local channels, plus CNN, BBC and Fox. With an extremely close relationship with the US, and an antagonist approach towards Russia, China and others, Prime Minister Abe appears to be highhandedly bringing the country into military conflict with its neighbors, namely Korea and China, while the population is completely ignorant of this and stuck with ever shrinking social services. What is absurd and ridiculous about all this is that there does not exist any need whatsoever to antagonize our neighbors. China is one of the main trading partners of Japan. So is Korea. We have been growing (or shrinking) economically, through mutual gains and losses. Honestly, Abe is playing a very stupid game thinking that because of the 1960 Security Treaty with the US, we should be behaving like this. Considering Japan’s foreign policy, these words could be interpreted as hypocrisy, even cynicism. Japan is working hard to support the West at the very moment when the West is pushing the world towards a possibly fatal confrontation with peaceful but mighty nations, like China and Russia. The average Westerner, in his sleek complacency, will see in the tea-ceremony but another instance of the thousand-and-one oddities which constitute the quaintness and childishness of the East to him. He was wont to regard Japan as barbarous while she indulged in the gentle arts of peace: he calls her civilized since she began to commit wholesale slaughter on Manchurian battlefields. The Asian continent would be delighted if Japan would stick to its tea ceremonies, especially after sending Prime Minister Abe to his ideological adopted homeland across Pacific Ocean. This article was posted on Monday, May 25th, 2015 at 2:46pm and is filed under China, Imperialism, Japan, Militarism, Patriotism, Politics.